Join us at the Career & Internship Fair! Call for Posters: We are seeking 8-10 students to make and present posters at the Career & Internship Fair to be held on Thursday, September 27th, 2018 3:00-5:30pm in Hoversten Chapel. Reflect on and articulate impact of internship experience. Gain experience in designing a visual composition. Create a high-quality product that reflects your professional experience. 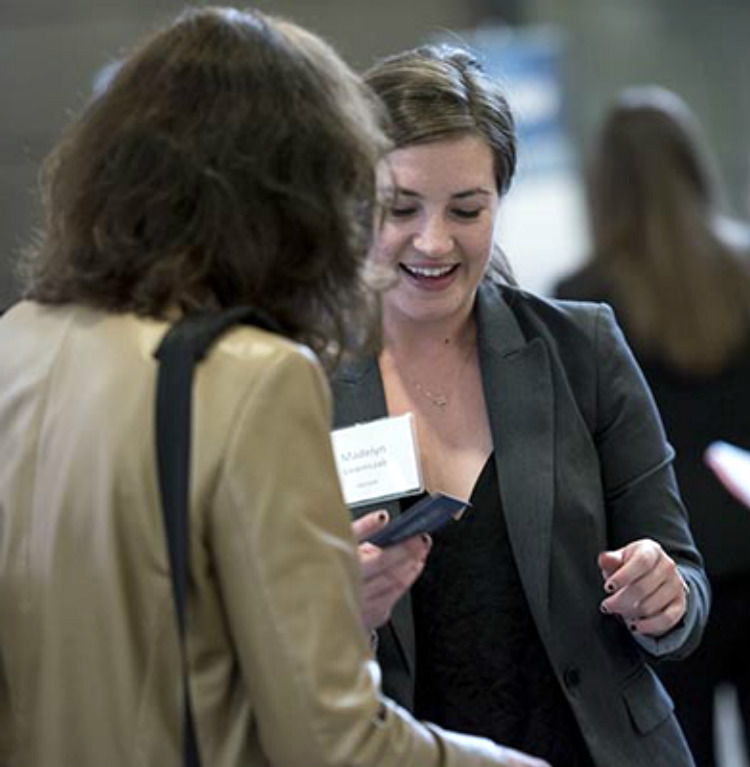 Network with employers at Internship Fair – show employers (with photos!) your professional side. Make an impact: your “story” is a great encouragement to other students. 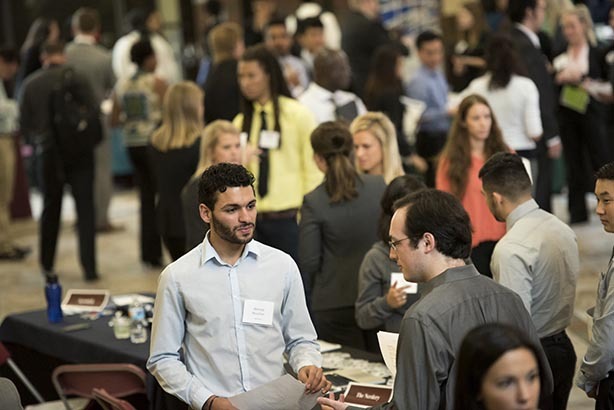 Many make the decision to look for an internship after talking with their peers. Permission. Discuss this poster project with your supervisor. Students must have permission from their supervisors to develop a poster. Be sure he/she understands that his/her name, company name, company logo, etc. will be included. Please feel free to share this web page with your organization/company. Photos. Great shots are essential! Please plan to have 3-4 high-resolution photos for your poster. Ideas include an “on the job” photo, photo with mentor, photo with team members, a head shot, etc. (Please do not crop original photos; send any quality phone photos in large format). Format. Posters will be made on a standard Power Point slide template using a common template. Note that STEM students can choose to create their own posters (following guidelines) or have Sabrina Doré (of STEM programs) make them. If you plan to have Sabrina make your poster, please complete the Internship Fair Questionnaire. Be aware that quotes will be pulled from this form, so information should be accurate and text well-written. Approval. Before printing, approval from students and mentors must be obtained. Other interested parties, such as Strommen, faculty/advisors, etc. will also have the opportunity to voice concerns/edit. 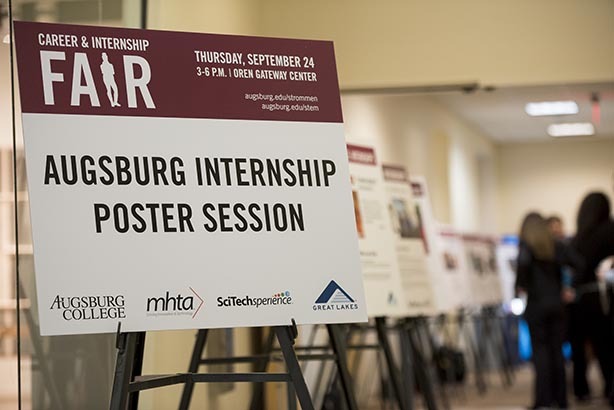 Important: Poster presenters need to present at the Internship Fair (9/27) 2:45-5:30 PM. All students will be asked to complete the 2018 Feedback survey following the event as student input has proven to be extremely valuable. 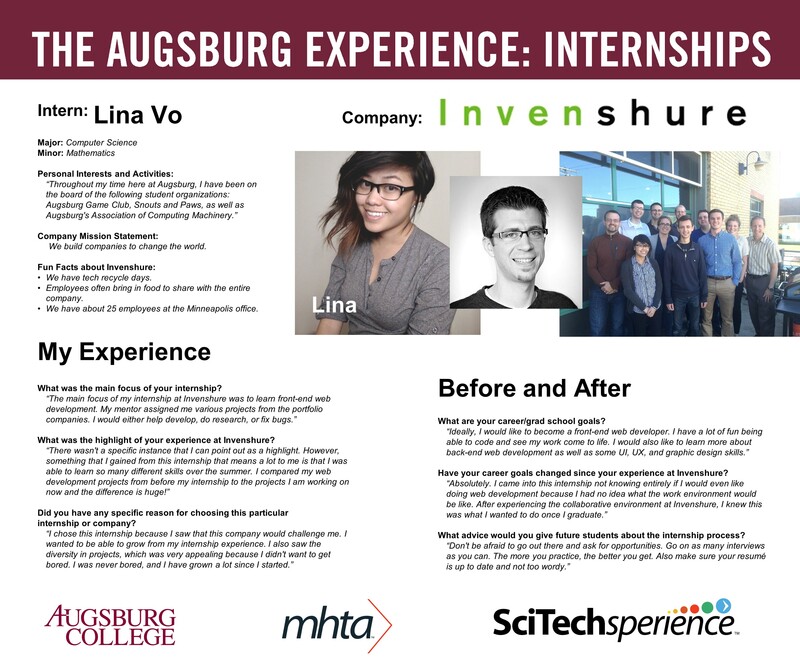 Posters and photographs remain property of STEM Programs and the Strommen Career Center of Augsburg University.